"I have severe hyperpigmentation I bought this product of course in the beginning I feel that I've wasted money because nothing seems to work. Well not true I've used illuminatural for 7 days after the third day I talked to my sister she is a chemist she told me that alpha arbutin one of the products in your serum is absorbed better if the the skin is damp i started to use it that way today is day seven and the severe darkness of the hyperpigmentation is barely noticeable and my makeup doesn't look like I smeared mud underneath it this product not only works i actually feel pretty instead of feeling like a freak.please pass this review on so others will use a product that works but I feel having a damp face injected its ability to work faster." You need to be VERY careful when choosing a skin lightening treatment. There are some dirty little secrets in this industry that less scrupulous companies, spas, dermatologists and cosmetic surgeons would prefer you didn't know about because they make their money promising clients 'instant' results. The ONLY true 'bleaching agent' available for sale today is hydroquinone – which has actually been BANNED by the European Union, Canada, Japan and France as it has been known to cause cancer in humans, including leukemia! Beware of other TOXIC substances like Mercury! Many products that contain hydroquinone will also toss in OTHER toxic chemicals to improve the 'bleaching' effect of the hydroquinone – including mercury!!! So again, it's best to avoid products with hydroquinone. Because in our experience, manufacturers who cross the line to using hydroquinone don't seem to have a problem including OTHER toxic substances in their formulations! Yes, that's right… Spa treatments can make your dark melanin spots WORSE! Many so-called skin lightening treatment options like chemical peels, laser surgery, and professional microdermabrasion cause injury to your skin through the stripping or scraping of layers. And this injury can actually result in MORE dark spots by triggering “post-inflammatory hyperpigmentation” – part of your skin's natural healing process, where localized production of melanin pigmentation is increased! Basic skin moisturizers can claim to be 'skin lighteners'. This is maddening, but very basic skin creams can claim to be 'skin lighteners' because clinical studies have shown that regular use of a daily moisturizer (if you're not already using one), can have limited skin lightening effects over a period of 14-30 days. However, these results are NOT what the typical woman seeking skin lightening wants! And these results PLATEAU after 30 days! … This is the BEST WAY (and the only true way, in our opinion) to reliably get rid of those dark spots and patches on your skin! … And skip the pain, cost, and risk of side effects associated with more extreme choices like chemical peels, laser surgery, and microdermabrasion. Chemical peels, also known as derma-peeling or chemexfoliation, involve applying a chemical solution to the skin, causing the outer layers to dissolve, blister, and peel away. You are literally creating a 'controlled wound' – forcing skin to regenerate itself. The treatment itself can be painful, lasting up to an hour, with burning sensations followed by intense stinging that may require pain medication to alleviate. Afterwards, you can expect scaling, peeling, and redness to last 3-7 days, while particularly deep peels may cause water blisters that break, turn brown, and fall off for 7-14 days after the procedure. Ideal candidates for chemical peels are considered to be light-skinned, fair haired people. Those with darker skin tones are less likely to achieve 'optimal' results. And risks of complications are high. Complaints of scarring, permanent changes in skin pigment, uneven skin tone, and changes in skin texture are common. While do-it-yourself chemical peels can be purchased from many drugstores, medium and deep peels are best performed by licensed dermatologists or doctors. Costs typically runs $100-$900 per treatment and multiple treatments are often necessary to achieve desired results. 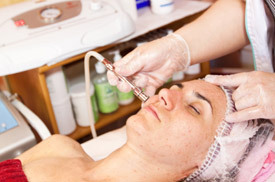 Various spas and dermatologists offer microdermabrasion treatments that involve gently sloughing off the surface layer of the skin using a diamond-tipped wand – removing dead and sun-damaged skin cells. It has little effect on deep pigmentation, scars, or wrinkles, but it can help your skin look healthier. It works by using an abrasive surface (a combination of the wand and skincare products) to 'sand away' the top layer of your skin – much like you'd use sandpaper to smooth a rough piece of wood. Risks include minor skin injuries that can trigger hyperpigmentation and scarring. 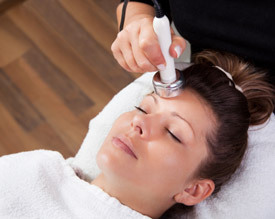 Costs for microdermabrasion treatments in spas can cost between $90 and $250 per treatment. Not to be confused with microdermabrasion, dermabrasion is a medical procedure that involves surgically scraping away the top layers of the skin. It is most often used to soften the sharp edges of skin irregularities like scarring to give skin a smoother appearance. It can also be used to treat deep acne scars. Less frequently, it's performed over the entire face. Like you'd expect of more extreme surgical scraping, recovery and healing time can take weeks to months. Costs vary depending on the size of the area treated, but range from $500 to $4000+. Laser skin resurfacing works by directing concentrated, pulsing beams of light at irregular skin, removing the skin layer by layer. It's most often used to treat fine lines and wrinkle, as well as acne scars. Those with ongoing acne issues or darker skin tones are not considered to be good candidates. It's also not recommended for stretch marks. Laser skin resurfacing is performed as an outpatient procedure using a combination of local anesthesia and sedative medications to control pain. A full facial treatment can take 90 minutes to 2 hours. Afterwards, dressing is applied to the treated area, which must be left in place for 1-3 days. Recovery time for laser skin resurfacing is 7-21 days, during which time it will feel like you have a moderate sun burn. Side effects may include swelling, bruising, and redness. Redness may continue after three weeks, but can be camouflaged with makeup until it fades in 2-3 months. 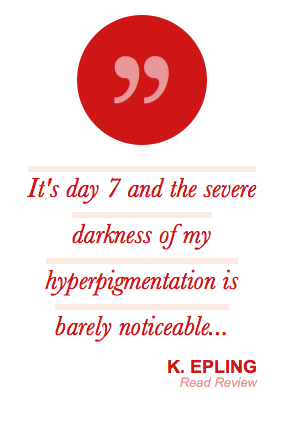 A risk of laser skin resurfacing is hyperpigmentation. According to the American Society of Plastic Surgeons, the average cost for laser skin resurfacing is $2,300. This treatment involves using liquid nitrogen to freeze skin lesions and remove them. The process destroys skin cells and forces natural regeneration. Over a period of 3-4 months following the treatment, excess melanin of dark spots like freckles and liver spots is forced to the surface and naturally sloughed away. Afterwards the skin may appear entirely normal, with even tone. However, there's also a risk of a white mark (called hypopigmentation) or scar appearing where the freezing was performed. It may be particularly noticeable for those with dark complexions and it may be permanent. As well, permanent numbness is a risk. 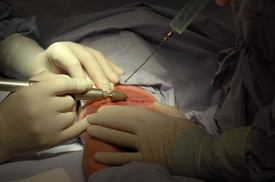 Cryosurgery should NOT be used to treat skin lesions that may be cancerous. It's typically used for single, spot treatments of sun spots, liver spots, warts and lesions. Costs for removal of a single sun or liver spot range from $60-$200 US. Currently, the only “bleaching agent” recognized by the US Food and Drug Administration is hydroquinone. And while it is still available for distribution in the United States (though strictly regulated), today hydroquinone is BANNED in the European Union, Canada, Japan and France as it has been known to cause cancer in humans, including leukemia. So you need to read labels carefully! Because products that contain hydroquinone are still easily available for purchase online. And these same products also frequently include other toxic chemicals like mercury to increase the whitening effects. If you choose to risk using hydroquinone, you should know – it must be carefully applied ONLY to the dark spots you wish to lighten. Otherwise, you risk lightening the surrounding skin to the same degree and losing your natural skin tone while creating a blotchy effect. You'll find there are literally HUNDREDS of skin lightening creams available on the market today. So choosing the 'best one' can feel overwhelming. Again, be sure to avoid creams that contain hydroquinone, mercury, or other toxic substances. And look for a cream that contains a clinically proven combination of active ingredients (otherwise, all you're getting is an over-hyped moisturizer). ... So that skin is naturally lightened, brightened, and whitened! Problem areas are noticeably lightened with daily application, with best results after use for at least THREE CYCLES of skin cell regeneration (approximately 90 days). And it comes with our generous 90-day money back guarantee. So you risk nothing. Plus for a limited time you're invited to buy a 4 month month supply & get a 5th month FREE!